In 2010 Nantucket High School installed a Northwind 100 kW wind turbine to reduce the school's electricity bills and serve as an educational tool to Nantucket students. Each year the Wind Turbine provides 12-15% of the school's electricity, and generates about $35,000 in energy savings! Stanton, Caroline. "After 5 years, wind turbine at school a lesson in sustainability". Inquirer & Mirror. 25 May 2015. Since its first year of operation in 2010, the Nantucket High School's Northwind 100 kW wind turbine has generated over 200 Megawatt hours (MWh). The Nantucket wind turbine provides up to 15% of the school's electricity, saving over $35,000 each year in electricity costs. In 2012, the Energy Office helped to register the NHS wind turbine to generate Massachusetts Class I Renewable Energy Credits (RECs), which the Town sells to National Grid for approximately an additional $12,000/year. The wind turbine and the educational elements installed in the high school to monitor its output encourages students to learn first-hand how technology, energy, and the environment relate to the community and the world. It's been a windy year on Nantucket! Click HERE﻿ to view production data! reMain Nantucket is dedicated to promoting clean, renewable energy and has taken the lead in sponsoring Nantucket Greenhound, the Nantucket Climate Action Plan, and the NHS Wind Turbine. 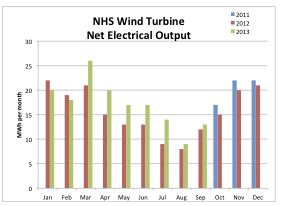 MassCEC is committed to fostering community scale wind projects like NHS' Wind Turbine. We are grateful for their generous financial support. NHS' Wind Turbine is the result of a collaboration of renewable energy-minded organizations including our local utility provider, National Grid, who was instrumental in making this project a reality. Students for Sustainability was founded in 2009 by a handful of Nantucket High School students who had an awareness of the need for renewable energy.